There are sled dog races and then there is the Tustumena 200 down on the Kenai peninsula here in Alaska. Hills is an understatement! I lived in Colorado for over a decade and climbed a Fourteener or two. The “hills” on the Tustumena were more like mountains. Let me see if I can put this in perspective. It is 3am and you are at the bottom of a hill and way up, I mean WAY up, you see another musher’s headlamp flickering in the distance straight up in the air. I say to myself: I have to climb this? This type of thing happened over and over and over on the second 50 mile leg from Freddies Roadhouse checkpoint to Homer. As all of you know we arrived in Alaska in the summer of 2010. We did what many do and packed up what would fit in a U-Haul trailer and the back of my Toyota Tundra and headed North to chase a dream or two. The first two winters I was partners with a Serum Run mushing kennel here in Willow. We didnt do any races but I learned a lot about Alaskan mushing. I had been mushing for a long time in the 1990’s and early 2000’s but got out of it to raise a family. This past summer we built our dog yard and moved all of my dogs over from where they had been the previous two winters and decided to try it on our own. Soon we were up to 30 dogs getting some great dogs from my friend Hugh Neff a couple from Vern Halter and several from Kasilof that we called the “Kasilof Crew”. We had two litters of pups; The Nightmare Crew and the 9-11 Crew. Throughout the summer and fall we trained and trained doing countless miles around the trails near the house and up on Zero Lake Road. Early into the season my daughter Nicole decided she wanted to run the Willow Junior 100 and I was planning of qualifying for the Iditarod. Our first scheduled race was the Top of the World 350 and I had to pull out for financial reason and Mother Nature. Heading into Christmas we had little to no snow on the ground. And then; The Northern Lights 300. I came down with a wicked case of Bronchitis that had me coughing through the days and nights for almost two straight weeks. Before I was 100% well I signed up for the Tustumena 200 and decided to give it a shot. First, let me say that the folks that put on the Tustumena 200 (also known as the T-200) are the best. Everyone from the organizers to the volunteers take their jobs very seriously and it shows. We arrived in Soldotna on Friday afternoon and went through our vet checks and dropped off our supplies that would be taken to the two checkpoints of the race; Freddies Roadhouse and the End of the Road checkpoint in Homer. On Friday night we stayed at our friend Dave’s fish camp in Kasilof. On Saturday morning we headed down the road a couple miles to the starting line. Other than parking us too close together, everything went off without a hitch. I was starting in the middle of the pack at #20 in a field of 38 mushers. Sure enough, my main go-to-leader, Denali was holding up his left leg. With just minutes before I was to leave the chute I have Tyler take Denali off the line and bring up Ty-Ty and Vela and place them in lead. Denali has been with me on just about every training run since I got him from my good friend Hugh Neff in October of 2011. He is not only my top leader but also one of my favorite dogs. He has the perfect sled dog mentality. Do what needs to be done, no questions asked. He is an awesome dog. I make it a practice to train as many dogs as I can to be leaders. You have to. You never know when something like this is going to happen. That being said the second string quarterback for the Patriots (what’s his name? I have no idea) practices as if he is to be called into the game at a seconds notice. But you can bet your bottom dollar you have a better chance of success if you have Tom Brady under center. I knew Ty-Ty and Vela could lead. They lead all the time. Often with Denali or on Nicoles team. So I hooked up the two girls–girls from the Kasilof Crew no doubt–and left the chute at 11:40 am. My plan was to run about six hours and rest for four. I had figured that I could go about 8 miles an hour and that would put me into each checkpoint in about six hours and give the dogs plenty of rest as we headed into the next leg of the race. With this schedule I would be on the runners about 24 hours and resting about 12. This should mean I would have finished sometime after midnight on Monday morning. Well as they say plans change. After about three miles into the race Aussie, one of my wheel dogs, started sneezing like crazy. I am sure he got a snout full of snow. He just wasn’t the same dog after that. He would pull for a few miles and then his tugline would get loose. He would do this over and over. After about 15 miles into the race I knew I would have to drop him. As we headed towards Freddies we were going up and down the hills and leap frogging several mushers along the way. It was apparent that I was not going as fast as most of the teams after about 3 hours into the run. I didn’t let it bother me though. You see, to me sled dog racing isn’t necessarily about who is in front of you or who is behind but that your dogs are pulling good and you maintain some form of schedule. I pulled into Freddie’s in 6 hours and 5 minutes. I was right on schedule! I started tending to the dogs and making their meal and hailed over one of the veterinarians. They were great by the way. I told them about Denali and told them I had to drop Aussie. I signed the paperwork and she took him for an exam. About an hour later she came back and said he appears dehydrated and was running a bit of a temperature but otherwise okay. Let me talk about temperature for just a sec. It was dang hot on during the race. Well into the 30s. So warm, most of the mushers were just wearing light fleece jackets on the trail. “I raised those dogs from puppyhood. Imagine that, Ty-Ty and Vela in lead,” he exclaimed! That made me feel good. Maybe these girls could do it. We pulled out of Freddies in 3 hours 15 minutes. 45 minutes ahead of schedule. I found out very quickly what she was talking about. Within a half an hour the hills started and didn’t stop for the next 11 hours. I thought I was prepared. Boy was I wrong! First off I did not think about myself in my prep. I was so concentrated on the dogs that I didn’t take into account my personal needs. I have done hundreds of 50 mile runs. But as I said before I have never done anything that was like this. Shortly before midnight I started feeling desperate. I had already drank the two Capri-Suns I brought along with slamming 64 ounces of water at Freddies. I had a Nalgene bottle with some gear in it (matches, poncho, fire starter, etc.) and that was it. I was so thirsty that I started eating snow. It was all I could do from becoming dehydrated. Around 1:00 am dogs started showing me that they weren’t up to the task. We came upon a hill that was at least 2000 feet in elevation and as I have said before the incline was that of of a set of stairs you may have in your house. About halfway up Vela pulled over to the side where the snow was deep and commenced to bedding down. The other dogs followed. I figured it was best to give them a rest. I know, I know I broke every rule in mushing here but I figured here I was four hours in and probably about three of four to go. I thought I was at least halfway to Homer. I knew I wasn’t at the back of the pack and several other mushers would be coming along shortly. I snacked the dogs with fish and waited. Within 30 minutes I saw a headlamp approaching. The team passed and I waited a minute or so and took off. The dogs are always willing to chase another team. They did that and we made it up the hill but little did I know this was just the start of a long night. The next couple hours were up and down in the hills with not much trouble. Around 2 am we had been on the trail for five hours. I thought I had to be getting close. We headed through a flat swampy area in conditions that they dogs are well used to running on here in Willow. Then the mother of all hills was upon us. It was pitch dark out with little in the way of moonlight and overcast skies. I could see that there was a hill in front of me but I didn’t know how high. Then way up in the air I see a headlamp bouncing up and down. It was a musher that was already heading back. I snacked the dogs again and started up the hill. About halfway up the dogs stopped again. I tried to coax them but they weren’t budging. Musher rule number (967) never let the dogs dictate when they are going to stop. Well they did and a musher’s worst nightmare comes to light. What am I going to do if I can’t get these dogs to go again? The long and the short. He did that and finished the race. I thought of this and decided this was what I was going to do. I let the dogs rest for a while and a few teams passed us coming down on their way back to Freddies. Most of them asked if everything was alright as they flew by at 15 miles and hour. 3 hours?! I thought I was a half hour, maybe and hour out at this point. Boy was I wrong. Those three hours turned into five as we traversed the landscape and above the tree-line. It was beautiful and you could see the lights of Homer in the distance. I didn’t let the situation discourage me. I think that is musher rule 1426 or something like that and we just kept marching on. At some point I put Sidney in lead. I don’t know why I didn’t do this from the start back in the chute but you know what they say about hindsight. Sidney listens to me really well. She is very atune to my commands and will follow me just about anywhere. So over the next few hours when we came to another what-seemed-like-impossible climb I got of my sled and walked in front of my team and they followed. Mistake number who knows–I was not in shape physically for this race. I was trenched in sweat, dying of thirst and fighting off the last bouts of bronchitis. But I had to make it to Homer. I just had to. Let me back up a sec. Shortly after switched Sidney into lead I noticed that Cassie, a little 2-year old female was not pulling her weight (so to speak) so instead of risking injury I put her in the bag. I was now down to nine dogs and Cassie was getting a ride in style. This just added to the weight of my already-too-heavy sled. Around 5 am we came to the power lines. We HAD to be getting closer. We went up and down again and again. Another musher passed us and said I was only 30 or 40 minutes out, hang in there. Me and the dogs were exhausted. I knew right then we had to scratch. We finally pulled into Homer at 7:20 am. 11 hours and 5 minutes after we left Freddies. I was 5 hours off my schedule. The checker told me where to park and said that there was straw and food inside (it was a elementary school) and you can sleep in the library. Someone fetched me a bucket of hot water, that was nice, and I started tending to the dogs. I prepped their meal, put down the straw, and made them comfortable. After my chores were done I went inside and gathered some pulled pork, a roll and a couple Cokes and then called Michele. I told her the news and told her I had to scratch and to have her call Tyler and have him start heading this way. I laid down on the straw next to Bodhi, Raegan, Sidney and Ty-Ty and covered my head with my parka and caught an hour or so of sleep. I woke up to see a guy with a TV camera and a note pad and I answered his questions. Then I spoke to Vern. Vern Halter is not only a very well respected musher completing many Iditarods and Yukon Quest but he is also my neighbor living just a quarter mile down the road. I respect everything he says. He told me to feed them as much as they can eat and let them get a good long rest–six or eight hours or so. While I saw where he was coming from I knew the team was wiped out. Heck, I was wiped out. I knew we couldn’t make it back to Kasilof with what we had to work with. Without risking injury to the dogs and the race rule about finishing 18 hours or less from the winner, who passed me way back on that first huge hill about 6 hours earlier. Calculating those six hours plus six hours rest and the possibility of another 11 hour run to Freddies, a mandatory 4 hour rest (per the rules) and a 6 hour run to the finish line I was not going to make that 18 hour threshold. So at around 11 am, 24 hours after I started I offically scratched from the race. I later found out that four of us scratched including the only musher that was still in Homer with me who was told he had to because of the 18 hour rule. I did what Vern said and fed the dogs twice and let them rest. At about 1:45pm Tyler drove up in the truck and we packed all of the dogs and the gear and headed home. We stopped off in Kasilof to pick up Aussie and grabbed a pizza in Soldotna and listened to the Super Bowl on the radio. We talked about what happened and what we need to change. We arrived home exhausted at shortly before 11 pm put the dogs back into their houses and they quickly settled in. I showered and fell right asleep. 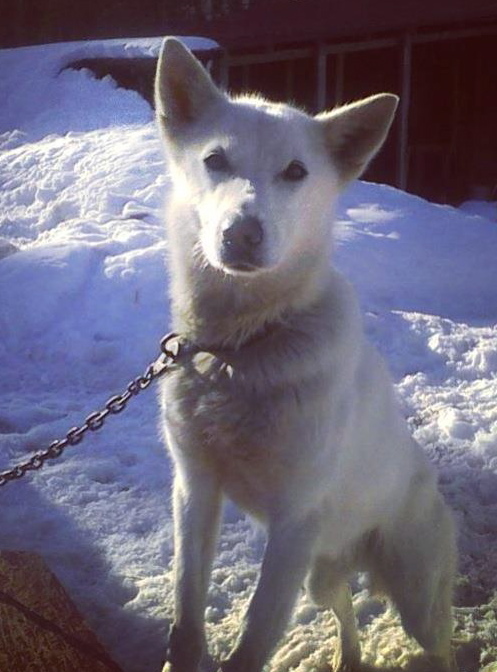 Any musher will tell you that you have to do right by the dogs. They did their job and I am so proud of them. They have no idea it was a race or we had to scratch. They were doing what the loved to do. While I was still in Homer I went up to each one of them, kissed them on top of the head and told them how proud I was. They all gave me a wag of a tail and a kiss on the cheek. Even Vela and Ty-Ty–these guys were shy since we got them this summer and now they are giving me kisses! But this 100 miles taught me things. First I should have started with 14 dogs. I was crazy to start with 12. I did that because I only have an 8-hole dog box and and many of the dogs were doubled up or rode with us in the cab. Second, don’t count on one dog to pull you into the finish line. While we all hear stories about the famous lead dogs in history–names like Balto, Togo, Larry, Walter and Annie–it is rare that one dog in the kennel is the super-star. When I had to leave Denali behind at the start I just knew I should have thrown in the cards. Third, The sled. I had the biggest and heaviest sled in the race. I made it a point to go up and down the staging area to see who was running what. This issue is already in the works of being fixed. Fourth, Me. I was in no condition physically to do this race. I know I am 30 pounds too heavy and my only addiction in the world is Coca-Cola. I also know that I should not have been running a race like this just 4 days off of Prednisone. Mind you I made it up and down all those hills and probably was off the sled for 20 or 30 of those 100 miles I was whipped when I pulled into Homer. Fifth, Training. My dogs had plenty of miles on the trails this year. We averaged well over 300 miles a month since October. The problem is living in Willow with trails out my back door is a blessing and a curse. The tallest hill we have on our “home trails” is maybe 1/10th of what we experienced this weekend. If we are ever going to attempt this race again we have to train for it. Sixth, Preparation. I over planned for this but I under estimated the rigors of the trail. I didn’t bring enough snacks and nothing but a couple fruit roll ups, some beef jerky and a few Capri-Suns for myself. 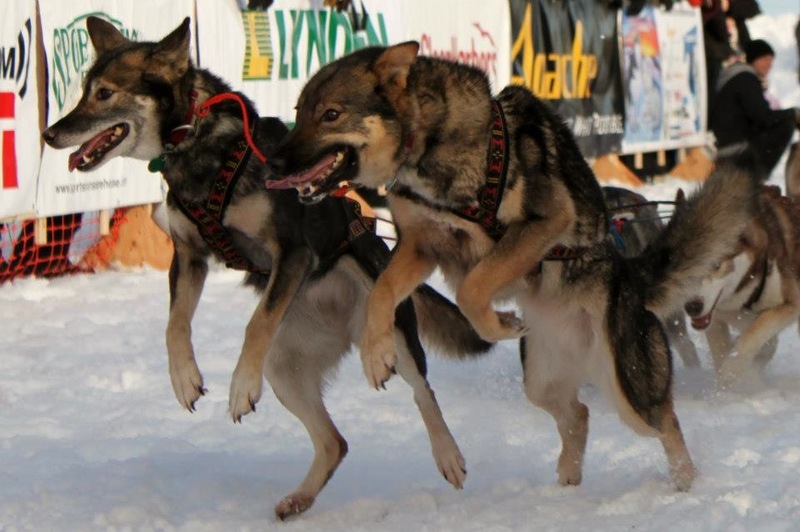 The weakest link on any dog team is always the musher. That sums it up right there. Seventh. We started too fast. Remember what they say about Rome? Something about it not being built in a day? While we have been mushing dogs a long time, we are only seven months into having our own kennel. For some that may be enough time. For us it just wasn’t. Like most musher families we have full time jobs, and another 50 or 60 hours a week goes into taking care of and training the dogs. It is a full time job in itself. The top mushers in the world will tell you if you want to be the best you have to focus on mushing all the time. To us that just is not a reality right now. Eighth. The last and most important rule is learn from your experience. I learned a lot this past weekend. Much of it from those around me at the checkpoints. If a musher will just sit back and listen you can learn a lot from your peers and most will answer your questions if you just ASK. In closing, while we didn’t reach our goal we all came back safe and had a pleasurable time doing it. What is it they say about hindsight again? We will dust ourselves off and mush another day. We have too, my daughter Nicole has a 100 mile race this weekend! Hi, my name is TyTy and I am part of the Kasilof Crew that joined Team Ineka in the summer of 2012. I am one of the leaders here at the kennel and I have been in several races; including the Tustumena 200 with Robert where we had to scratch because it was so dang hot, and the Willow Junior 100 with Nicole. I am pretty shy until I am in my harness and hooked up to the sled. Then I am all business. I will pull and pull and pull. I am pretty good at listening to the musher and will even break through deep snow when there is not much of a trail. I have an interesting trademark. Some time when I was younger I got a little bit of frostbite on my nose so now it looks kinda cool. I am the veteran of two Junior Iditarod’s with Nicole and one of the main leaders in the team. I am currently training the up-and-comers Atreyu and Bastian of The Oracle Crew to lead too. If you would like to sponsor me that would be pretty neat! You know lots of people wear jerseys of their favorite player but not many people can say, “hey I know a lead dog and I sponsor her too!” You will also get a signed picture of the team, your name on our dog truck which is really cool if you own a business and care about promotion and stuff like that, and you can also ask me questions anytime, well at least you can ask the musher anytime. When he said that I knew I was in trouble! So a couple days after the race I hooked up with a great family business, Sled Dog Systems here in Willow. We had met earlier this summer about their sleds when they were up in Alaska looking for property to make the “big jump” in moving from the Midwest to Alaska. Kim, Dan and their boys make some of the most innovative sleds in the world. 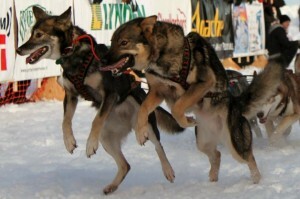 One of their top clients is Iditarod Champion, Jeff King. If you know anything about King he is the unequivocal “King” of innovation on the trail. If my memory serves me correctly he was the first person to use the “shorty” harnesses that many use today as well as the “trail-dragger sled” that is seen here and that many of the top teams use today in long distance mushing. The sled I got is a prototype of the K-5 line and its is the lightest, most maneuverable sled I have ever owned. I have never driven a trail dragger sled and it does have a bit of a learning curve to it. I am used to pedaling from the rear of the sled. This design makes that nearly impossible. 1. The sled is built on on standard eight foot aluminum OCR runners. You can fold down the sled to make shipment a breeze. Story goes that Jeff King checked one of these sleds as baggage on an airplane to Nome! 2. The front bag is very innovative. It looks like something you would see on a sprint sled (Sled Dog Systems makes them too). It was a wrap around design covering the brush bow. The sled does not have a traditional bed made of plastic and the bag “floats”. I placed a 1/4 inch piece of painted plywood in mine to give it some rigidity. The bag is attached near the driving bow in a way to remain stationary during turns. The eliminates gear shift in the bag. The bag has a mesh panel in case you need to carry a dog. 3. The driving bow has to placements, similar to what you would see on a sprint sled. This allows for greater efficiency in pedaling. The driving bow is also adjustable. 4. On the driving bow is a piece of plastic where your snow-hooks rest and they can be attached with a bungee. This is another innovation often seen on sprint sleds. 5. The drag mat can be folded up out of the way when not in use. It is of ample size, covering most of the area between the front of the sled and the rear. 6. The braking system is very innovative. It is small but packs a big punch and grips the trail with its sharp teeth. It is attached to the bridle. 7. The cooler “seat” and the rear of the sled is what is newest to me. I have been driving traditional stand up sleds for my whole career. The cooler “seat” is a medium sized marine-grade cooler that is attached to the sled by a couple of bungees. I tested the seat out on several trail conditions (a lake, a winding trail, and an open rolling trail) and it proved to be remarkable in its handling. I never knew that mushing could be so comfortable! With a slight lean and a a small adjustment to the driving bow with your hands the sled maneuvers very well from a seated position. 8. The cooker compartment is located behind the cooler “seat” and makes a great place to store extra gear along with the cooker to provide equal weight distribution along the entire sled. The bed of the cooker compartment has holes in the plastic to help eliminate ice and snow built up. 9. The trail dragger portion of the sled can be removed for normal/shorter training runs when the extra gear is not needed. 10. The folks at Sled Dog Systems sewed the bag for me to match our team colors of black and red. They added a checkerboard pattern as well. I don’t know how well that will be perceived at the starting line, but all in good fun! I am looking forward to running with this sled in the coming weeks and maybe a race or two later in the season. I will give a full report at that time. All in all it looks like a fun and innovative project that I am sure to love!